If there is one thing common in nearly all the houses you have visited, the milk is being stored in the door of the refrigerator. There is a great reason for storing it that way, it fits there properly. One gallon of milk pack flawlessly fits in the refrigerator door. Putting milk in this location is convenient as well because milk is used frequently in every house and it is quite easy to grab and replace the milk from there as well. It is very annoying to store a milk because it spoils quickly each time it is not handled properly and sometimes it gets tricky to decide which size of the carton is suitable for your consumption before it spoils. So you might be asking yourself, why the milk should not be stored in the door of a refrigerator. Well, simply because the door is the warmest spot in the fridge. Every time the fridge is opened, it is exposed to the warm environment of your kitchen. Things stored in the front side of the fridge (like in its door) are directly exposed to that heat exchange whereas items stored in the backside of the shelves remain cold. Milk and eggs can go bad in a matter of time and therefore, they should be kept in a cool and steady temperature. Less perishable items like soda, jams, ketchup, jellies, and salad dressings are more suitable to be placed in the fridge door. Simply put, the products that are needed to be kept at a cool and steady temperature like milk and other dairy products are unsuitable to be stored in the door of the fridge because it has frequent temperature fluctuations. Drinking a spoiled milk will have bad effects on your stomach. To avoid that, smell the milk before drinking it and remember not to put it in the refrigerator's door. Spoiled milk can be used for many different things, however, it is not healthy to drink it. 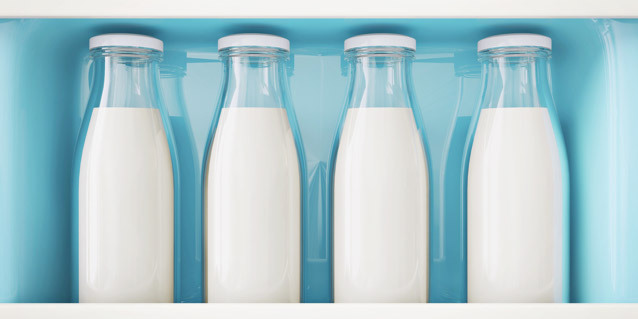 There are several ways to keep your milk fresh and safe to drink for a longer period of time. Like storing any other kind of food, proper storage and organization are required to store the milk. So if you care about the health of your family and yourself, and wants to drink safe, fresh, and delicious milk, you should avoid placing it in the fridge door. Instead, the best place to store the milk is a middle or lower shelf of the fridge.